The stylistically challenging German play centers on an Asian fast-food restaurant. Inside a small, ragged circle of oil drums, 5-gallon buckets and wire baskets, all perched on the concrete lip of a wide pond, five actors whirl, a cyclone of action. The cast of Quantum Theatre's production of The Golden Dragon is rehearsing to portray the harried, Asian-immigrant staff of a "Thai/Chinese/Vietnamese fast-food restaurant" — as well as a dozen other, mostly non-Asian, characters. German playwright Roland Schimmelpfennig's acclaimed 2009 work requires protean performers, each able to switch rapidly between three or four roles, crossing barriers of age, gender and ethnicity. For instance, Schimmelpfennig's "man over 60" plays a young stewardess; his "young woman" portrays a middle-aged man whose female lover (played by "a man") has left him. Other narrative threads include one kitchen worker's rotten tooth and an updated version of the fable of the hard-working ant and the playful cricket, the latter bringing to a brutal point Schimmelpfennig's exploration of globalization. Quantum artistic director Karla Boos directs actors Aidaa Peerzada, Catherine Moore, Curtis Jackson, Gregory Johnstone and Mark Thompson. Boos, as usual, chose the play because the script seemed to her strange and challenging. Adding a few levels to this theatrical Rubik's Cube, Boos is staging Golden Dragon outdoors ... on water. The playing area is the concrete pier trellising the Highland Park pond known as Lake Carnegie, plus five floating (but anchored) wooden platforms. 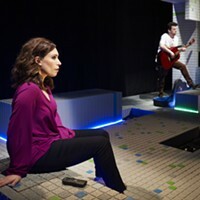 The concrete walks extend left, right and upstage up to 75 yards from the audience. That means technical challenges: mikes for the actors, not to mention the lighting and complex prerecorded audio cues. 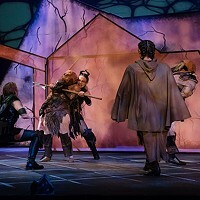 Boos says she chose Lake Carnegie to echo the play's water imagery, and because the show benefits from occupying this popular stretch of park where everyday sights and sounds provide a backdrop. "We are letting the world be the world," she says. Still, the biggest challenges might be setting the play's tone, and acclimating audiences to Schimmelpfennig's curious post-Brechtian style: Actors narrate some of the action as though reading from a postmodern novel about themselves, and verbalize ("long pause") their pauses. But the unconventional casting and stylistic quirks don't feel random. 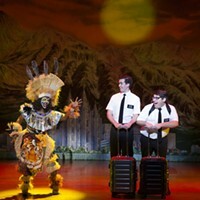 To Boos, the play is about "otherness" — about whom, in this globalized and increasingly interconnected world, we deem like ourselves, fully human, and whom we don't. "Ultimately," she says, "it's about indifference or empathy."